California's historic drought has put the state's water problems in the forefront this year and those problems aren't likely to be solved when the clouds open up again. Nowhere is that more apparent than in the water system's central hub -- the Sacramento-San Joaquin Delta. 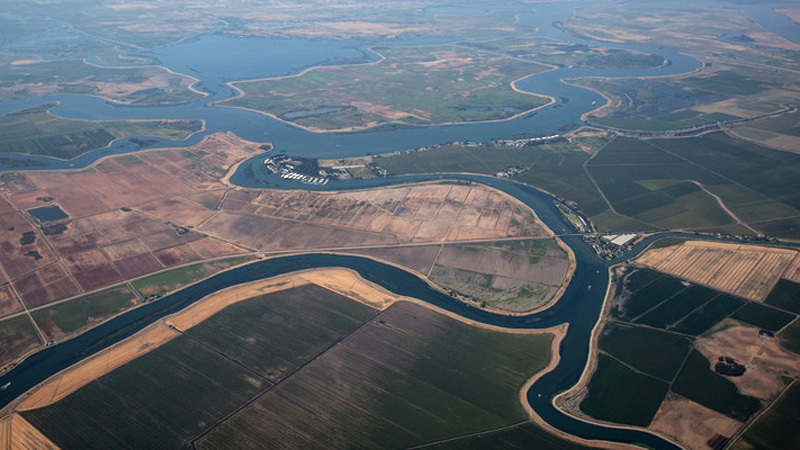 California's Delta is the flashpoint for the state's water politics. For decades, its ecosystem has been in ecological free fall, prompting fierce battles over how much water should be left in the environment, and how much pumped to farms and cities hundreds of miles away. Now, a new report from the San Francisco Estuary Institute documents why the Delta's ecosystem is failing for many of its endangered species. The findings could inform efforts to restore the estuary, which some argue would make the water supply more reliable for the entire state. “It’s guidance for what would make a healthy ecosystem –- the missing elements,” says Robin Grossinger, who worked on the report at the San Francisco Estuary Institute. Using historical maps and records, Grossinger and colleagues pieced together a landscape that’s been almost completely transformed over 150 years. The Delta was once a network of marshes and water, supporting birds, wildlife and one of the largest Chinook salmon runs on the West Coast. After the Gold Rush, settlers diked channels and waterways, creating islands of dry land protected by levees. About 97 percent of the marshland was lost. The Delta is also the hub of the state’s water supply, because it’s where major rivers converge, carrying 50 percent of the state’s runoff. Early water engineers built a network of canals and pumps to tap into the supply and today, the water is delivered all the way to San Diego. 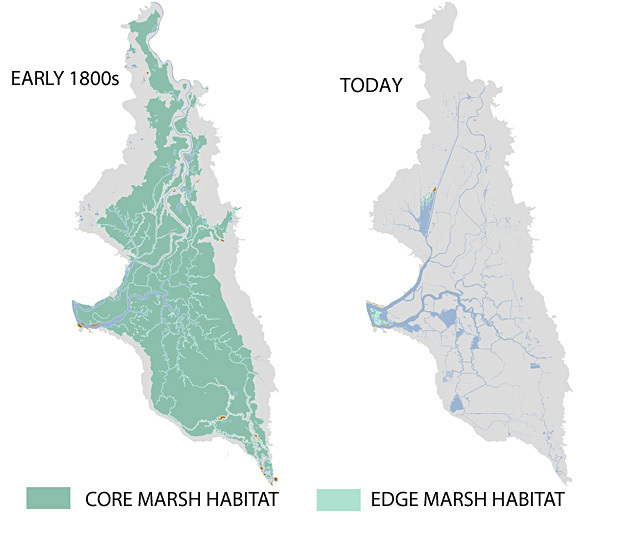 Building on a 2012 report that detailed what the physical landscape once looked like, San Francisco Estuary Institute researchers mapped how the historical ecosystem once worked, including how water flowed and how species interacted with the landscape. The boundary between water and land was continually in flux in the historical Delta. Tides would arrive twice daily from San Francisco Bay, spreading through a network of tidal channels that looked much like capillaries. 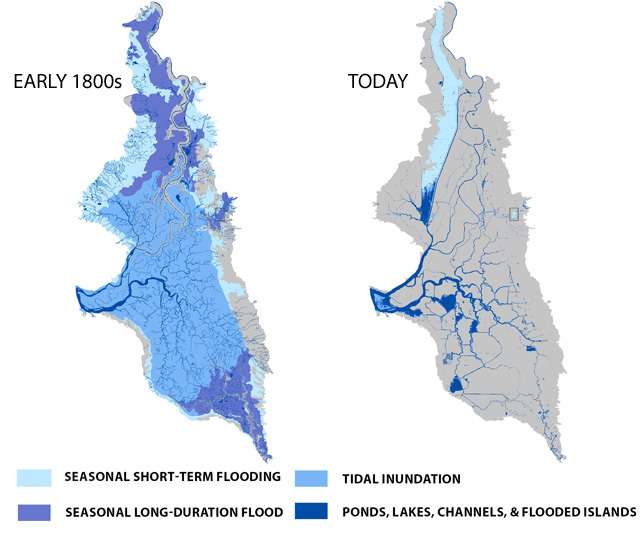 Other land would flood seasonally, as snowmelt caused the Sacramento and San Joaquin Rivers to overflow their banks. “There was a massive expansion of habitat as the water moved across the landscape,” Grossinger says. The seasonal flooding was key for Chinook salmon. Young salmon would find food and refuge in the floodplains, as they migrated out to the ocean. Millions of birds, migrating on the Pacific Flyway, would use the vast wetlands as they traveled through. Today, the connection between land and water has been largely severed. With most of the Delta’s marshes gone, scientists have few places to look to as models for habitat restoration. “The function part is the missing link,” says Carl Wilcox of California’s Department of Fish and Wildlife, an agency involved in species restoration. The report outlines three key ingredients for creating marshes that could support birds and wildlife; marshes must be large, broad rather than narrow and neighbor other marshes of different sizes. Of the little marshland that exists in the Delta today, only 11 percent meets those conditions. The two largest marshes in today's Delta were created accidentally. Sherman Island was flooded when its levees failed in the early 1900s, and aquatic plants have grown in since. The Liberty Island marsh was created after a levee failed in 1998 and the land was abandoned. The findings of the report could inform a major restoration effort that’s proposed for the Delta, part of Governor Brown’s plan to built two massive water tunnels. The Brown administration says the project is crucial to maintaining a reliable water supply for two-thirds of the state. The tunnels would divert freshwater from the Delta, potentially harming some endangered fish species like salmon and Delta smelt, depending on the water conditions. The state is counting on 30,000 acres of marsh restoration help endangered species and offset those harms. How and where to do the restoration is still a matter of debate, both for scientists skeptical of the extent of the wildlife benefits and Delta residents who farm or live in the area.